I finished this book in two days. Granted, that mostly had to do with the fact that I was in an airport for a grand total of seven hours during those two days, but still, I'm glad brought two books in case I finished one. In this case, I did finish one and this was the book. It was a fast read. It wasn't fast in that it was too short and had little to say. The plot was very fast-paced and moved fluidly. It grabbed my attention and never really let go. There were some parts that were more emotionally driven than others and sometimes they got really intense. Luckily, Robin Pilcher was kind enough to give us time to recover from them with scenes that would calm us down. Spoilers, as always, will be kept to the minimum. This review will be on the shorter side since I have nothing to seriously critique, especially since the things I would critique on require the giving away of spoilers. I was grateful for the summary because it both explains and deceives. Yes, it does explain a good chunk of the story, but it also sets up your expectations. I'm not a big fan of long text summaries, mainly because I feel like the whole story is being told to me already. It's kind of like when movie trailers show all of the best parts in a movie before one actually sees the movie. This book, fortunately, did not entirely live up to the stereotype. The plot was well-paced. It moves back and forth in time and place for a majority of the novel, but Pilcher is able to properly outline and mark which chapter is in the past and which is in the present. The two main timelines are 1) the present with the adult Claire and her husband and 2) the past with teenage/college-age Claire with her mother, stepfather, step-siblings, and her friend/love interest, Jonas Fairweather. As the plot is well-balanced, it allows for greater development and fleshing out of the important characters. I thought Claire was a well rounded character, Art was a very likeable husband, Leo is the kind of father (or stepfather) we all would like to have, and Claire's mother is truly a joy to read about. Jonas is like the anti-hero - you're not sure if you should like him and, by the end, you're torn as to whether you should pity him or hate him. The only truly unlikable characters are the step-siblings, a somewhat typical trope when it comes to main characters acquiring new family members. I have yet to find a story where the step-siblings actually get along well with the main character. If anyone has novels to disprove this, please message me with them or you can reply to this review. Yes, Claire and her step-siblings don't get along for the typical reasons, but the deeper reasons behind their dislike of each other are rather cruel and unusual. You'll have to read the book to understand what I'm talking about. You always get the feeling that something isn't quite right with them, but you don't truly find out until much later on. It's a nice device that Pilcher uses to keep you interested, but the pay off, well, doesn't exactly pay off; at least, not for me. Although I loved the stepfather, Leo, some aspects of his character frustrated me. If the character types of Cinderella were forced on the characters here (minus the evil stepmother), I feel like Leo would have been Cinderella's father. He's kind, funny, astute, and understanding, but he holds himself back and when it comes to certain social situations, he doesn't really know how to handle them. Early on in the story, the reader observes the step-siblings being disrespectful to their new mother (Claire's mother). Instead of chiding them or punishing them, Leo lets them get away with it. This, in turn, results in Claire's mother arguing about it with him. Leo deals with the fresh, new problem by going to his greenhouse and taking care of his plants. Granted, I know that a good amount of people might react like this, and that's understandable, but, for the rest of the novel, it doesn't seem like Leo truly learned his lesson. This fault is highlighted in the extreme when it is finally revealed as to why Jonas broke off his friendship/budding romance with Claire. I won't spoil the reason as to why Jonas and Claire drifted apart, but I'll address it briefly in case there are some of you who have read this story. I was, quite frankly, shocked. At the same time, I was skeptical. I couldn't help thinking, Is this really plausible? I won't deny that there are many happenings of life that I am sheltered from and therefore don't understand, but this whole event just bamboozled me. It just seemed random and a little too extreme. If anyone would like to discuss it with me, please message me, I'd love to discuss it. Overall, this novel is heartwarming and it stresses the importance of communication and family bonds. Claire and Leo are the epicenter of this novel and the other characters are drawn to them through their bonds with each other. Not all of them are good, but each one addresses a relationship that nearly anyone can connect with. The descriptions of New York and Scotland are detailed and vivid - I truly felt like I was in the countryside of Scotland at Leo's home or in the throes of downtown NYC, walking with Claire as she makes her journey through life. It may have been a fast read, but it still touched me and I feel that I have a deeper understanding of the importance of human relationships. I would definitely recommend it to anyone who is interested in reading this. 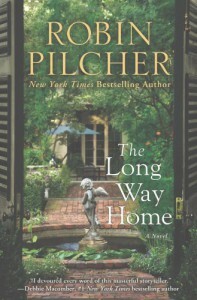 That being said, I give The Long Way Home a well-deserved A. Please remember to support the author by buying the book from a bookstore, online, or borrowing it from the library or a friend.